Ryan ten Doeschate is a Netherlands cricket team’s aggressive all-rounder. Currently, he becomes a most successful all-rounder of ODI matches with highest career batting average 71.21 of 28 matches after striking century against a world’s fifth rank ODI cricket team England in the world cup. So now everyone's doubt is cleared that why Shahrukh Khan chose Ryan ten Doeschate for Kolkata Knight Riders team. Prefer this article to know about reasons of why Shahrukh chooses ten Doeschate. Ryan Neil ten Doeschate is full name of Ryan ten Doeschate, who born at South Africa. He is attacking batsman as well as medium-fast bowler. Perhaps for this reason, the owner of the Kolkata Knight Riders IPL team, Shahrukh Khan put his choice on ten Doeschate for his 2011 IPL squad. 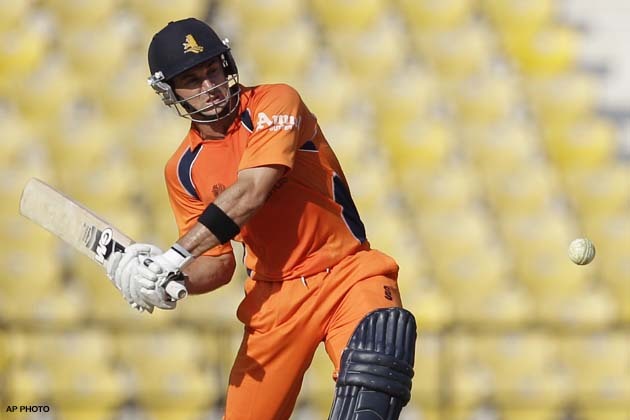 Ten Doeschate is rising cricket star of ICC Netherlands team. He strikes right-hand style batting. He has joined his ODI cricket career since 2006. He had broken record of David Hemp by making unbeaten highest score of 259 and completed with the unexpected average of 228.66 including four successive centuries. He also became the leading wicket taker of Netherlands. He has played domestic cricket matches for Essex County Cricket Club since 2003. With aggressive batting, he also delivers right-arm medium-fast style bowling. During the 2007, he was chosen for the Netherlands team for the World Cup 2007. But before playing in the world cup, in the warm-up match he took total five wickets of the strong Indian team including wickets of Sourav Ganguly, Virender Sehwag, Yuvraj Singh and Mahendra Singh Dhoni. In the opening match of ICC T-20 World cup 2009, he had also played important role by beating the host country, England. He captured two wickets of opening batsmen of England team, Ravi Bopara and Luke Wright and scored 22 not out. On 22nd February 2011, ten Doeschate has recorded an ODI’s highest batting average of 71.21 from 28 matches in the ICC history. His score of 119 in 110 balls in Nagpur during the 2011 World Cup match against England is excellent and recorded as highest individual score by player of Associate Nation Playing against a Test Playing nation. He had also received honor of Associate and Affiliate Player of the Year 2010 during the ICC Awards at Bangalore. With all over score of the ODIs, he scored one century and three half centuries. In second day of the IPL-4 auction 2011, Shahrukh Khan chose ten Doeschate for Kolkata Knight Riders team and placed $150,000 bid for ten Doeschate. Then lastly, he was sold for KKR team. Mostly, the bidders put their focus on the world’s leading and high scored cricketers because they do not want to place any risk by bidding new and fresh cricketers for their teams. And other cause is that T-20 is only 20 overs match therefore fast batsmen are first choice for the bidders. It is not possible that all cricketers will be successful. Hopes, the choice of Shahrukh Khan, Ryan ten Doeschate may be proved beneficial for his team in the upcoming IPL matches.